Time to Talk day, Hirameki fun and a partly coloured doodleedoo. Yesterday was Time to Talk day; a day with the focus on encouraging people to talk, especially about mental health in order to help to end the stigma and discrimination that people with mental illness experience. Many celebrities and organisations supported this day, which is brilliant! I’m a champion for Time to Change Wales. This means I volunteer to go to events, businesses and organisations to encourage people to talk about mental health, as well as to tell my story of my mental health problems and the stigma and discrimination I’ve faced, as well as the help and understanding I’ve been given and the little things that employers did that helped me to remain in teaching for as long as I did. It was quite appropriate that the first time I went to tell my story was on Time to Talk day! I went to Remploy in Pontypridd and talked to both the employees and some of their service users. Bev from Time to Change Wales was there to support me the first time I did this. Getting the powerpoint presentation sorted was a major job for me and showed me how much my concentration has been affected by my extended bouts of anxiety/depression in the past few years. It took me forever to add just five slides to the presentation! Telling my story was easy, yet at the same time it was difficult. It opened up some sores, brought back things I thought I’d left behind when I left teaching, and had me in tears at some points, which resulted in me making some self-stigmatising statments such as ‘sorry, I’m being stupid with these tears’ and then saying that was self-stigmatising. I got through it. Bev, the longest serving champion who’s done over 100 anti-stigma talks, said I did well. People thanked me for sharing my story. I came home emotionally drained and well out of sorts though. I’m feeling a bit more me today, but still drained. It was still worth it, still a good thing to do, especially if it gave one person what they needed to get the help or to talk about mental health themselves. One of the things I do to help re-balance me when I’ve been drained/overly emotional/triggered as I was yesterday is to have a nap. The other thing is to do art. Art has been my great source of solace and peace for me during my worst times, and it continues to be so. 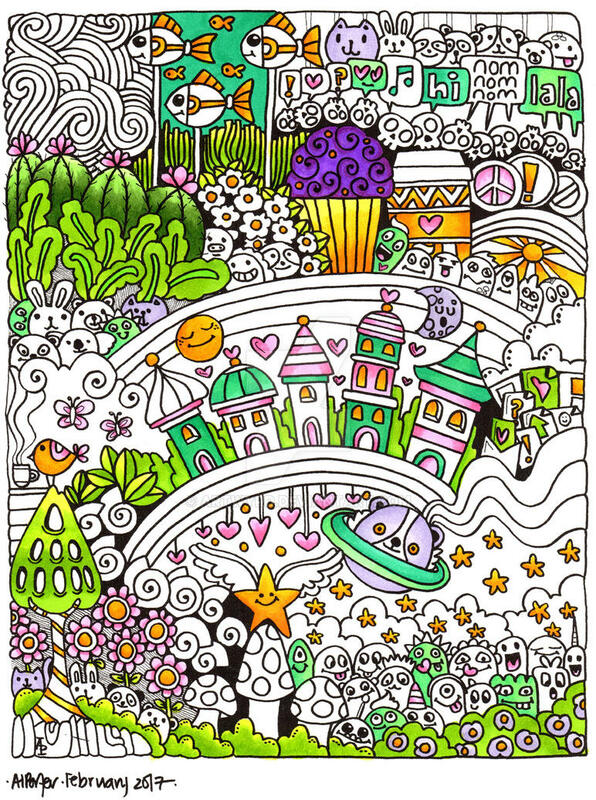 I partly coloured in a doodle-type drawing, using my Copic markers this time. After the talk yesterday, I had a wander to Churchill’s stationery in Pontypridd to pick up some art supplies. 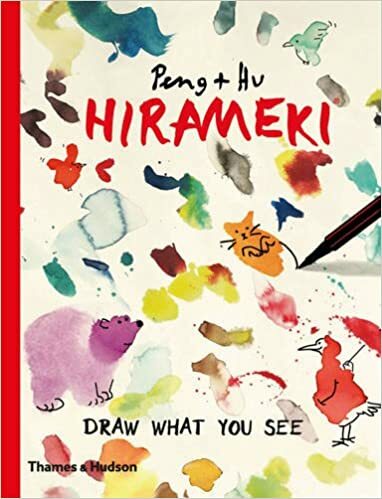 There, I found a little book called Hirameki:Draw what you see by Peng and Hu. “In the beginning was the blot. With just a few strokes of the pen and a dash of your imagination hirameki gives a sublime and unexpected sense of satisfaction and delights the hand, eye and mind. The little blot will reveal its true self. From ‘Hirameki: Draw What You See’ by Peng and Hu. 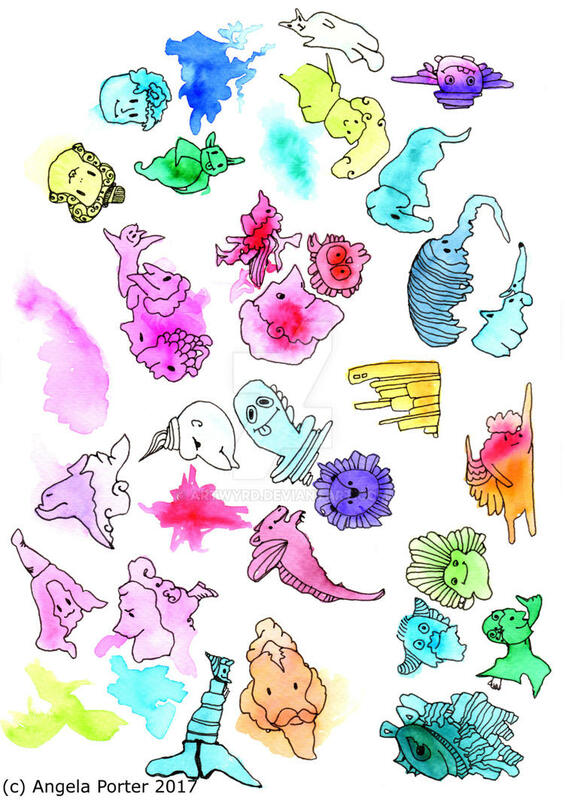 I had a lot of fun, both making the blobs of colour and then trying to let my imagination run free. I found out, however, that my imagination isn’t what I thought it was, or that it is rusty and out of use. I will persevere, however, as there are some characters/objects there that I can make use of in my doodly style of art! They’ll be added to my visual vocabulary/library in my zibaldone.